Looking to buy high-quality motor run capacitors? Your search ends here. We stock plastic and metallic case electric motor capacitors that are safe, lightweight and compact – the kind that do what they are supposed to. Whether you wish to start up an air conditioner or forced air furnace or you simply want to keep that old Jacuzzi spa pump running without a hitch, the products that we supply will see you get the job done affordably. Quality. 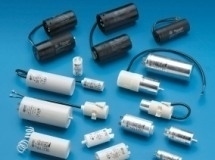 We stock quality Motor Run Capacitor products! The components that we supply form part of the esteemed DUCATI range and ItalFarad, which are widely recognised as being the best on the market. Expect motor run & start capacitors that offer low non-inductive winding loss and do not leak or short circuit. Price. High quality doesn’t always equate with high costs. We have longstanding relationships with the product manufacturers, so you will be hard-pressed to find another capacitor supplier who can match our pricing. We also run promotions on items from time to time. Simplicity. Ordering is quick and easy with our user-friendly checkout cart system. Simply click the “Capacitor Shop” tab above, select your item from the dropdown menu on the next page and then enter a few billing and shipping details. Click “PLACE ORDER” and you’re done. Speed. We deliver fast. In fact, we are dedicated to getting your product to you as quickly as possible. All orders placed between Monday and Thursday are normally delivered in 1-2 days but not guaranteed. Excluding weekends or bank holidays. NEWS: We will soon be adding capacitors for domestic appliances like washing machines, dishwashers, washing machines and many other home appliances. Information. While we are not at liberty to dispense technical advice on products, we do believe that an informed customer is a happy customer. For this reason, we provide free electric motor capacitor information on this website, enabling you to purchase with confidence.